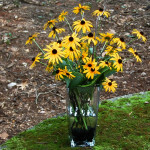 Impress your family and friends, at the Thanksgiving meal, with your holiday centerpiece. 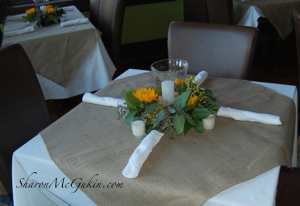 The color and fragrance of fresh flowers on the table makes them feel like special guests. Allow the colorful foliages, textures and forms of the autumn season to inspire you. As I wind up my curving driveway in the Fall, I always feel as though I am entering a live postcard. We can use those same bold Autumn hues for our Thanksgiving decoration to create colorful traditions that our families will fondly remember. Use fresh flowers in a centerpiece to add a celebratory touch to your holiday table. Incorporate pods, cones, and berries to add surprising texture and form to your traditional floral centerpiece. Fill a cornucopia, or ‘horn of plenty’, to represent abundance, fertility, and nourishment. A large horn-shaped container filled with flowers, fruits and vegetables, autumn foliage, nuts or grains, pods or cones, reflects the beauty and bounty of our own family garden. Add strands of wool to the floral centerpiece creating a soft, cuddly, ‘wooliness’ that makes us want to reach out and touch it. 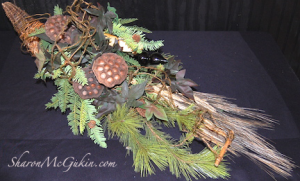 Accent a pottery, glass, or porcelain turkey by placing it on a bed of moss, leaves, flowers or other natural materials. Fill tall glass vases with berries and vines submerged under water and place a floating candle on top. Gather colorful fruits and vegetables around the vase bases for visual balance. Group pumpkins and gourds for a colorful collection of shapes and colors. Decorate with birds by placing these ‘fine feathered friends’ in the natural materials of their habitat – such as branches, twigs, or vines for a realistic touch. Cluster small blooming plants of varying heights in co-ordinating containers, along with a few added leaves and pinecone, together as a live tablescape. Gather branches of Autumn leaves to intertwine with Fall collectibles or pottery pieces in the center of the table. Thank you for reading this blog. I’m thankful that you’ve shared your time. Want to enjoy more design tips and floral adventures? Subscribe now and download my ‘Decorating for Celebrating’ Ebook. If this message resonates with you, please share it through the social media below.